I'm really enjoying writing blog posts for competitions at the moment, not only do I love browsing the websites but it gives me a chance to blog about things I wouldn't usually blog about. Like the get fit, feel epic blog post and The White Company post. I'm also 'practising' for looking for prizes I really want by searching twitter, facebook and google. So i've come across a few different competitions for bloggers. Seem as I can't enter them all I thought I would share them here with you. 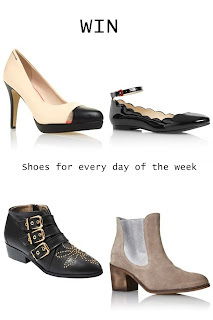 A Daisy chain dream is giving away £500 giftcard for Next when you blog about your favourite shoes from next (this is one of the first blogs I started reading and love it). This ends 25th January (maybe I will have time to enter this!!) You can find all the details here. The next competition for bloggers is the get fit, feel epic competition, where you can win different gadgets to help you get fit. There seems to be a few blogs hosting the same competition with moneysupermarket.com. They end on the 31st January. Most of them are asking you to make new years resolutions to help you keep fit and healthy. Check out full details on yummymummyintraining, keepinghealthygettingstylish and of course Mum reinvented which is the one I entered. Here's the same competition but this one ends on the 27th January.Details on The black pearl blog. And Fat girl Slim is hosting it. You have a little bit more time for this one, it closes on 7th February. And finally most of you bloggers have probably already seen this one, so here's a reminder - zulily are asking bloggers to create a blog post about how to take photos of you children sharing your best tips. The winner will receive a £100 voucher and 2 runners up will win a £25 voucher to spend at Zulily. Find all the details here and you will need to get your entries in by 31st January. Good Luck if you enter any.